Japan's sumo association fired Thursday the trainer of a teenage novice who died after an alleged beating by fellow wrestlers. Police questioned stable master Tokitsukaze, 57, and the other trainees under his care after 17-year-old wrestler Tokitaizan collapsed following practice on June 26. He was preparing for July's Nagoya Grand Sumo Tournament. Tokitaizan, whose real name was Takashi Saito, died later in a hospital. An autopsy showed his body had numerous bruises and wounds that did not appear consistent with those sustained in normal sumo training. The Japan Sumo Association decided Thursday to fire the stable master, association chairman Kitanoumi told a press conference. The dismissal means the trainer was expelled from the sport indefinitely. "Tokitsukaze's action was not appropriate for a trainer," Kitanoumi said. "The incident damaged the association's credibility and honor significantly." 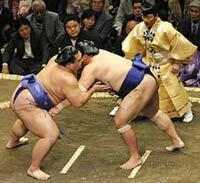 It is the first time that a stable master has been fired in the history of sumo, according to Kyodo News agency. Kitanoumi and other senior officials also decided to take pay cuts, the agency reported. Tokitsukaze, whose real name is Junichi Yamamoto, has acknowledged he struck Saito on the head with a beer bottle the day before he died, and forced him to train so hard that he could barely stand on the day of his death. Tokitsukaze is not facing any formal criminal charges. The boy's father told reporters that his son fled from the training facility twice - once in mid-June and again on the day before his death - but did not say he had been bullied or assaulted. The Saito case is the latest crisis facing Japan's national sport. Earlier this year, grand champion Asashoryu suffered a nervous breakdown and flew back to his native Mongolia after sumo elders berated him for skipping an official appearance.